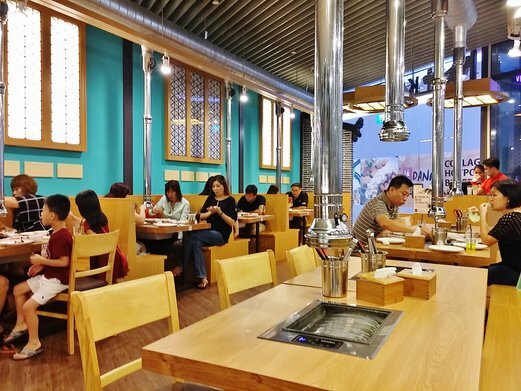 H and I stumbled upon this Korean BBQ restaurant when we were shopping at Waterway Point some time ago so we arranged to come back on a weekday for their lunch buffet. 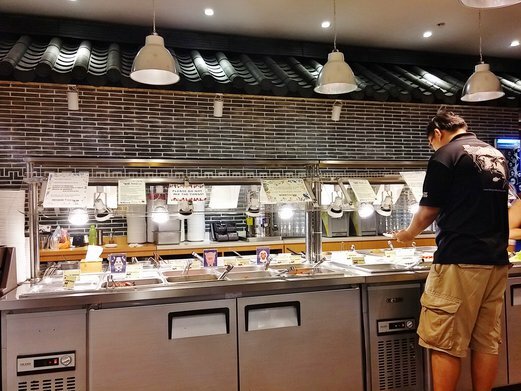 Prices were considered very reasonable as this was an all-you-can-eat Korean BBQ buffet. 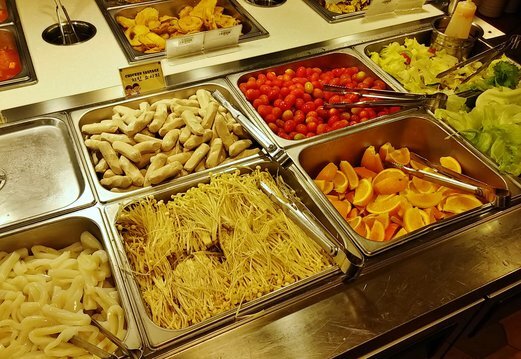 This was the main buffet island for raw meats, vegetables, sauces, condiments, appetisers, fruits & cooked food. At the back was the beverage station with a free flow selection of different soft drinks (mountain dew, 7-up, pepsi, miranda orange or ice lemon tea). 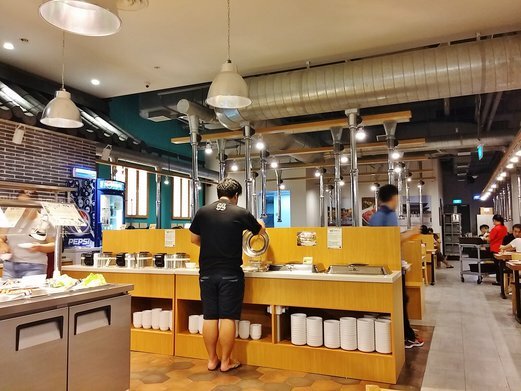 And on the side, there were also steamed rice, kimchi fried rice and 3 types of soups. For lunch, the spread wasn’t huge but good enough since the meats were just what we cared about when indulging in Korean BBQs, lol. Prawn lovers, you would probably be disappointed as the only seafood available was squids. What I did was to combine the squids, enoki mushrooms, sliced onions and tangy soy sauce dressing onto the grill pan and make my own stir fry with that. Tasted pretty good. Give it a try! The chicken sausage was the chipolata kind. I would prefer the normal frankfurters to these. 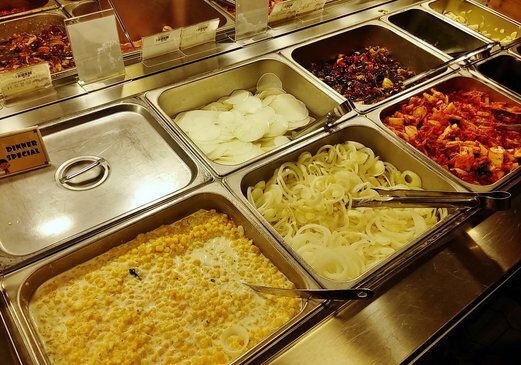 You would notice that at some sections, there were 1 or 2 chafing dishes with lids on. Those were meant to display additional special items for dinner only. So if you pay more for dinner, expect to see a (slightly) bigger spread. 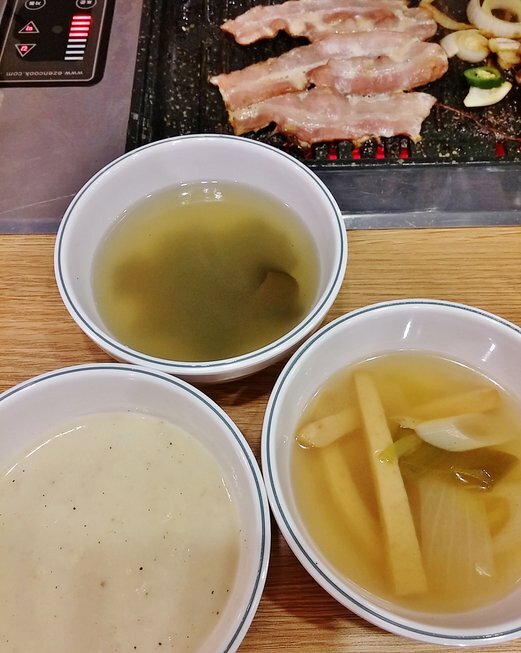 The pickled daikon and kimchi were also great accompaniments to the grilled meats. Must haves! Didn’t expect to have this selection of meats for a S$14.90++ lunch which ideally had all that we liked. 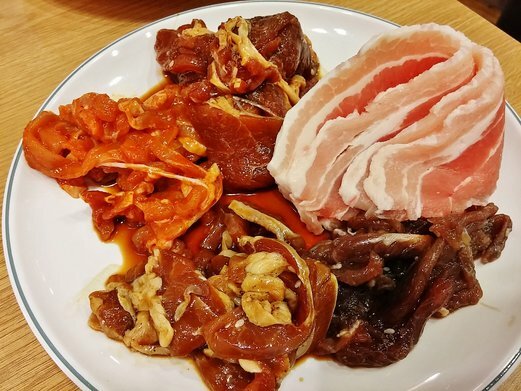 The 7 types included spicy chicken, bulgogi chicken, pork belly, pork bacon, marinated pork rib, pork collar and bulgogi beef. 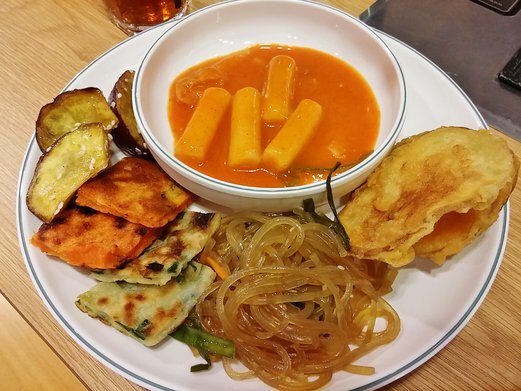 There were 6 items at the cooked food section – caramelised sweet potatoes, fried regular potatoes, tteokbokki, spicy stew, japchae and pancakes. The only thing that I didn’t take from here was the stew as I had just cooked a similar Korean stew the night before and just didn’t fancy it again. Mushroom, seaweed and fishcake soups. The mushroom soup tasted like a potage (quite starchy) with no mushroomy flavour at all. The seaweed and fishcake soups fared better though still not fantastic. Not a big loss if you decide to skip them. 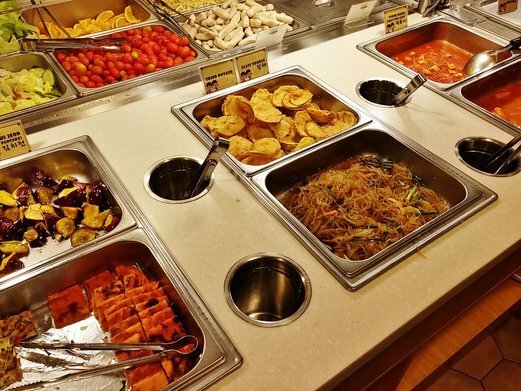 I particularly liked the sticky sweet potatoes and the fried potatoes which were like potato tempura but the standard was really inconsistent because the first batch we tasted was fresh and crispy but the subsequent ones were just soggy and greasy. The tteokbokki sauce was well balanced and the rice cakes were springy and chewy. The japchae was well marinated. Pancakes were not the best but were still decent when dipped in the tangy soy sauce. 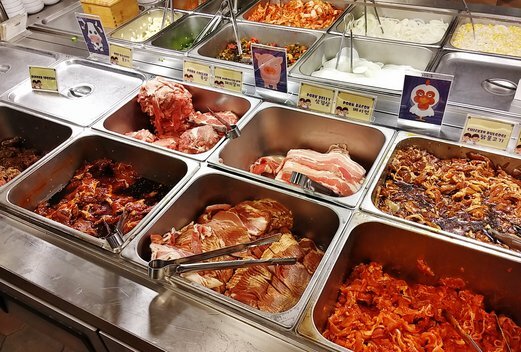 Of all the meats, we preferred the bacon, bulgogi beef, marinated pork ribs and spicy chicken best. The meats were fresh, nicely marinated and so tender when cooked. The pork belly and collar were plain so if you were going to wrap them with lettuce, it would be best to combine with kimchi, pickled daikon, fermented bean sauce and/or garlic (grill them first) for extra flavour. Good thing about dining here was that there was an extractor fan on every table so you wouldn’t have to worry having your clothes and hair smelling like BBQ or smoke. And I also liked that the grill pan had holes along the sides so excess grease and fats from the meats could just drain off. I really don’t fancy those BBQ places that use parchment paper on top of their grill pans because the end result just doesn’t taste as good. Staff were quick to replenish food supply which was remarkable. Overall, I thought the weekday lunch was pretty value-for-money. Meal was satisfying as the meats were tasty. And that was sufficient for us. 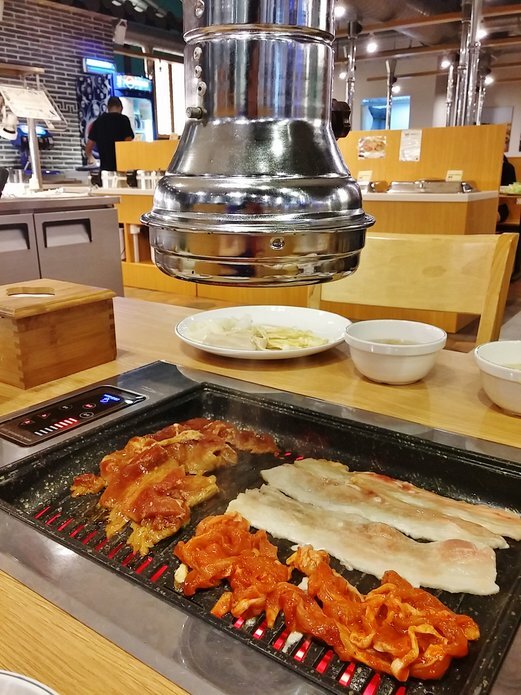 Will definitely be back again when we have craving for Korean BBQ.